Customer Showcase – Our Famous Tin Panels! One of our valued customers had a unique idea for our original tin ceiling panels. 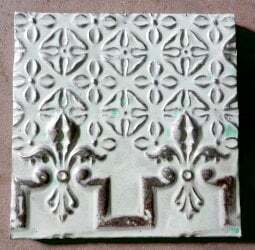 Originally 100 year old ceiling tin salvaged from NE United States commercial and residential buildings – this tin has been re-purposed by Olde Good Things to be used as decorative wall panels. These have been very popular for this purpose. But what did he do? 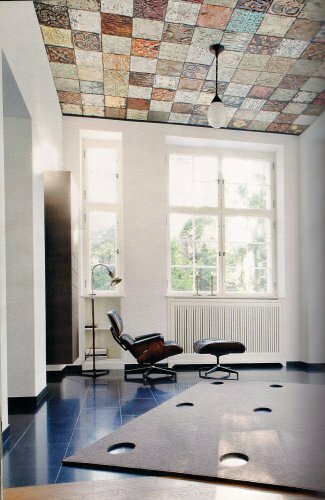 He used them as originally intended – as ceiling tin – but this time as a many faceted patchwork tin ceiling. Very nicely done. Come up with your unique ideas. These panels can be purchased online, through our retail stores and at our week-end outdoor sale locations at the Brooklyn Flea and Eastern Market in DC as well as Alameda Antiques Fair and the Rosebowl in California. 11 in. x 11 in. panels are only $35/ea. – 23 in. x 23 in. $65. 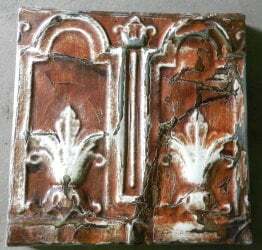 I am interested in your tiles , possibly ship to Canada. I was showing a customer this picture, and saw your question. I am so sorry we all overlooked this! Yes, we are the vendors who show at the Alameda Antique Fair. Most of the tin ceiling comes out of the New York City area. At Alameda, our spot numbers are P17 – P19. Our Los Angeles, CA store number is 213-746-8600; the men load up from there. I hope this still works for you.